You know what PP stands for? Polypropylene, A.K.A. a material that safe that even baby bottles are made of it. The PP construction will withstand any possible corrosion caused by the essential oils you use it with so that you’ll know exactly what the aroma diffuser is spraying in the air and what you’re breathing in. Enjoy an oil diffuser that comes with a vast 400ml capacity (compared to the average 300ml of similar products) while maintaining a compact and portable design. The extra room in the water tank will provide you with a total 14 hours of continuous mist for a purified air that’s easier to breathe. No matter where you plan to use your humidifier, its timeless wood grain design will make it the perfect addition to any kind of décor, whether it is at work or in the coziness of your home. Its unique build automatically filters the LED light for a softer and suffused illumination that’ll help you relax and won’t keep you awake instead. 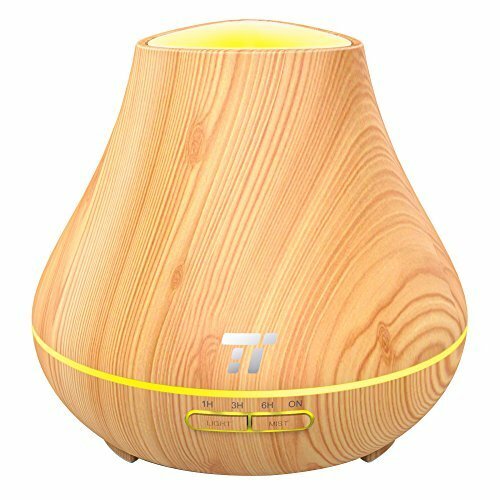 What’s the point of getting yourself an aromatherapy diffuser to ease stress and tension if that brings with it extra worries when it comes to its operation and effectiveness? This aroma diffuser comes with a built-in safeguard that’ll automatically turn it off when the water level is low. That means you’ll be able to turn it on at bed time and enjoy purified air during your sleep without any concern whatsoever.